What is your definition of courage? If you think that courage means being brave and following God even if you're completely scared, then you should meet Esther. King Xerxes desires a new queen. Let a search throughout the kingdom be made for some beautiful young women. Have them all brought to a palace in Susa. The one that pleases King Xerxes the most will become queen. Mordecai, have you heard the news? The king has chosen me to become his queen. He chose me! Yes, my cousin Esther, you have been chosen. But, do not forget that we are Jews from the tribe of Benjamin. Many people in this country hate Jews, so I warn you not to tell anyone that you are a Jew. I will not tell anyone, not even the king himself. Sometime later, Haman, an enemy of the Jews, persuades the king to issue a command against the Jews. I have a message from Haman, noble of King Xerxes. This message is written in the name of the king and is stamped with his royal seal. On the appointed day, all loyal subjects of King Xerxes are commanded to destroy, kill, and wipe out all of the Jews. This includes young people, old people, women, and children. You may also take any belongings of the Jews as your own. Mordecai fears for his life and the lives of all the Jews. 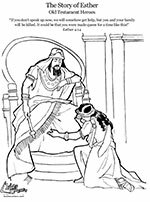 He goes to Queen Esther to see what she will do. Esther, have you heard the order from the king? It commands his people to destroy the Jews. You must try to go see the king and make an appeal for our people. But Mordecai, there is a law that no one may approach the king without being sent for. If I approach him, I could be put to death. You live in the king's palace, but you are still a Jew. What if you say nothing? You and your family will die. It's possible that you became queen for a time just like this. All right. Gather all of the Jews and fast for my benefit. Don't eat or drink anything for three days. Then I'll go to the king even though it's against the law. If I have to die, I'll die. After three days, Esther goes to see the king. Queen Esther, I am pleased to see you. What is it? What do you want? King Xerxes, I hope that you will show me your favor. I hope that you will think that what I'm asking is the right thing to do. I hope you are pleased with me. If you are, and if it pleases you, please let an order be written so that the Jews will not be killed. Please spare my people. That is my appeal to you. I will give this to you. Write another order in my name. Do it for the benefit of the Jews. Stamp the order with my seal. The king sends his royal messenger to announce a new command. On the appointed day when the Jews are to be killed, all Jews may gather together and fight for their lives. If the Jews are attacked, they may destroy, kill and wipe out their attackers and take the goods belonging to their enemies. Let all the Jews celebrate this day when we got rest from our enemies. This is the month when our sobbing turned into celebrating. We will celebrate with good food and with presents to one another and to the poor. If you want to read more about Queen Esther, her cousin Mordecai, and the lives of Jews in foreign lands, read the book of Esther in the Old Testament part of the Bible.